170 x 115 mm. – 89 leaves, with 3 large illuminated initials. Made c. 1500-1525, presumably in a Dominican convent in the diocese of Constance, by and for the Dominican nun who is visually presented by St. Dorothea (fol. 56); either a daughter of or paid for by Bernard and Elisabeth Peyer zu Freudenfels-von Münchweil, to serve for their memorial. 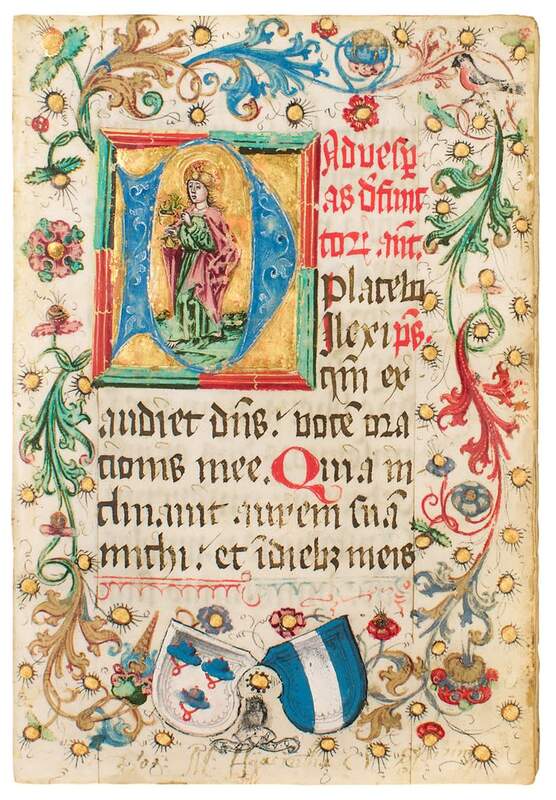 Written in Latin but with many title headings (rubrics) in German, this manuscript was written for Dominican use, for someone with special devotion to St. Dorothea as both St. Dominic and Dorothea are written in red ink in the Litany. The script shows the characteristics of an individual, personal hand, likely writing for his or her own use. The Office of the Dead is often part of a Book of Hours, but functions here individually. The use of the Office of the Dead in funeral services dates from an early period. The commemoration of the dead is of all times and cultures, but for medieval Christian men and women, the cult of praying for the salvation of the soul of the dying and the dead was one of the most important aspects of religious life. The Office of the Dead is recited or chanted next to the bed of a dying person or, when the body had been carried into church, next to the bier at a funeral service. Continuous praying by future generations supposedly was to extend the bond between the living and the dead. This precious tradition handed down from the Middle Ages is memorialzed in the Peyer zu Freudenfels-von Münchweil manuscript at hand. This work is now in the collection of the Archdiocese of Freiburg.